Rinpoche wrote this letter to a student who was struggling to maintain tantric commitments in a busy Western lifestyle. The student had received Highest Yoga Tantra initiations from Rinpoche and His Holiness the Dalai Lama, but had broken the commitments. After returning to the West, the student often tried to do the practices by waking up during the night but felt the need for more sleep and basic meditation. Thank you very much for your kind letter informing me of everything that you have gone through. I am sorry it took many eons for me to reply. Of course, I understand, but I just want to clarify this to you. After taking initiation from His Holiness the Dalai Lama or me, these commitments are not something that has no meaning or not much purpose in the life. It is not like that at all. 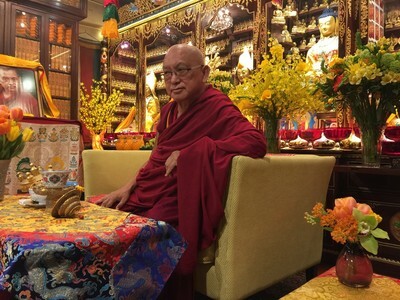 Generally these tantric practices are done with a lamrim foundation, correctly following the virtuous friend by looking at the guru as a buddha. The result is that you are able to see the guru as a buddha and from that realization you are able to generate all the realizations of the path to enlightenment. Correctly following the virtuous friend is the root of the path to enlightenment. This is such an important subject, the most important one in your life. Also, without renunciation—renouncing this life and future lives’ samsara—the practice of tantra doesn’t become the cause to achieve liberation. Not only that, without renunciation of this life, even if you practice tantra it becomes the cause of the lower realms. Therefore, tantra has to be practiced on the basis of renunciation, renouncing samara. And it should be done with bodhicitta, after having generated great compassion for all sentient beings. By knowing all the sufferings of each realm—the hell beings, hungry ghosts, animals, human beings, suras and asuras—and by [reflecting on] the general suffering in samsara, you can see how all beings are circling in samsara, through the twelve links. From this you generate great compassion for sentient beings and then you generate bodhicitta. If you practice tantra with bodhicitta, then that tantra practice becomes the cause of enlightenment. But without bodhicitta, tantra practice doesn’t become the cause of enlightenment. Even if you practice kundalini or chakras, winds, drops, dzog chen or dzog rim, or anything, the graduated completion state and so forth, it doesn’t become the cause of enlightenment. Without bodhicitta and without right view—the ultimate wisdom understanding emptiness—tantra practice doesn’t even become the remedy to samsara; it doesn’t eliminate ignorance. There is danger that it will become the cause of samsara. You can achieve enlightenment by practicing Mahayana Sutra, which is practiced on the lesser vehicle path. The subject is the four noble truths, which is the very basis of Buddhism. By practicing Sutra you can achieve enlightenment, but you need to create the cause—the merit of virtue and the merit of wisdom. The merit of wisdom is the cause of rupakaya and dharmakaya. It normally takes three countless great eons to achieve rupakaya and dharmakaya—the Buddha’s holy body and holy mind. Normally that takes so much time and because it takes a long time then sentient beings have to suffer for so long. Therefore, there is the need to practice tantra, the quick path to enlightenment. There are four levels of tantra: 1) Kriya Tantra; 2) Charya Tantra; 3) Anuttara Yoga Tantra; and 4) Maha-anuttara Yoga Tantra. With Kriya, Charya and Anuttara Yoga Tantra you can achieve enlightenment in this life, but you have to practice for a long life, for immortal life, to live for many hundreds or thousands of years and keep practicing, then it’s possible to achieve enlightenment even in that one life. Maha-anuttara Yoga Tantra is the quickest way to achieve enlightenment in this brief lifetime of degenerate time. In the past, most people lived for up to one thousand years. Now those living even up to one hundred years are very few. I guess most people live until they are sixty or seventy years old. The life span has become shorter and shorter because of degeneration of mind. A brief lifetime can be three years; it can be any length of time—seven years, ten years, fifteen years, twenty years or twenty-five years. To achieve enlightenment in a brief lifetime of degenerate time you need to practice Highest Yoga Tantra, which has the extremely profound method showing the path. The mind has gross mind, subtle mind and extremely subtle mind, and similarly the body has gross body, subtle body and extremely subtle body. The extremely subtle mind realizing emptiness is called clear light. [That realization is achieved] by developing the extremely subtle mind that directly perceives emptiness. If you are able to actualize the wisdom of nondual bliss and voidness in this life, then you are the one who is able to achieve enlightenment, the unified state of Vajradhara, in this life. That means you are able to quickly free the sentient beings from the oceans of samsaric suffering and bring them to buddhahood, the peerless happiness. From this you can understand that tantra has incredible skillfulness in the method, more than Sutra. Highest Yoga Tantra is the most skillful in method and wisdom. People who practice tantra—lower tantra or especially Highest Yoga Tantra sadhana practices—are very fortunate, unbelievably fortunate people. These practices leave positive imprints on your mind, especially if they are done with lamrim: renunciation, bodhicitta, emptiness. If the motivation is pure, then doing sadhana practice is an unbelievably quick way to achieve enlightenment—so fortunate, unbelievably fortunate, so much merit. It’s like those people who make profit every day of a million, billion, zillion, trillion dollars. Every day it’s like that, so the benefit [of tantric practices] is unbelievable, unbelievable, unbelievable. Even you don’t become enlightened in this life you have made so much preparation in the mind, you have planted the seed and you are much closer to realizations in the next life. You are much better able to attain the path and also in the next life you are closer and closer to enlightenment. This is a quick way to achieve enlightenment in this life or within seven lifetimes or sixteen lifetimes. It is amazing, amazing, amazing, wow! If you don’t know all these benefits you think you are just wasting time or you have difficulty making the time to do your commitments. You feel like you have to do them and then you can’t have comforts like sleep, or the commitments take you away from doing work or many other luxury things, which are basically distractions. You need to know that all these distractions and comforts are the cause of samsara and the cause of the lower realms. So many people don’t know this and then think that all these comforts are what they should have and what they need. Also you are not thinking of the benefits of these practices; how they are so rare and what an incredible opportunity you have this time. I can’t explain; it’s like a miracle, like a miracle, so rare. It’s hard to believe that you got the initiations and teachings from these incredible gurus, like His Holiness the Dalai Lama, who is like this time’s Buddha Shakyamuni, like previous buddhas who taught Dharma, but this time in human form as His Holiness the Dalai Lama. We don’t see that, how it’s unbelievable, unbelievable, so rare. In many ways this opportunity is unbelievable, but we don’t realize that. Instead, what happens is we think that having the comfort and happiness of this life is the most important thing. We are not even thinking about our future lives’ happiness; our hundred, thousand, million, zillion, trillion future lives’ happiness, which are countless. Until we actualize the four noble truths and the ultimate wisdom directly perceiving emptiness, which ceases the seed of delusion and karma, we will have to keep suffering. Therefore, it is more important to achieve total liberation from samsara forever. To be free forever from the suffering of pain and the suffering of change—all the samsaric pleasures such as music, food, sexual pleasure, our house, clothing, so many things. Not only the cessation of the suffering of change, but also the cessation of the third type of suffering, pervasive compounded suffering, from where the other two sufferings arise; total cessation of that. Then there is the blissful state of peace for oneself, ultimate happiness; that is unbelievable, so impossible. We think the happiness of this life, which is very short, is most important, more important than all that future happiness. We don’t think of peerless happiness, buddhahood, the total cessation of all the obscurations and completion of all the realizations. We don’t think about trying to achieve that. Even if we are very intelligent, we still don’t know that and we think that the happiness of this life is the most important thing. This is a totally wrong concept. What is more important in reality is those other future lives and most important of all is buddhahood, the peerless happiness. We have this wrong concept due to ignorance, thinking that the happiness of this life is the most important and then in this life we are totally distracted by that. We live our life with that [wrong concept] and that’s why we are unable to practice Dharma. The works of this life are regarded as very important and we do that, but Dharma practice doesn’t get done; it gets delayed and delayed. Even if we want to practice, we delay and delay, and it doesn’t get done or we don’t find time for it. We only find time for this life. All the actions done with this mind become negative karma, meaningless, and they become the cause to be born in the lower realms and to suffer in this life and future lives. Our life becomes empty in this way. Then at death time so much fear comes, even if we don’t accept reincarnation and karma. So much fear arises because we have created a lot of negative karma. First of all, there is the fear of separation from the family, the objects of attachment—our wife or husband, our children, our father and mother, our family. Then there is separation from our possessions, the objects of our attachment. Then, separation from the strongest object of attachment, our own body, that we have cherished the most, more than any other sentient being. We have incredible fear of being separated from that. We also fear rebirth in the lower realms, instead of being born as a human being or in the deva realm. So much fear arises, thinking that something terrible is going to happen, even if intellectually we don’t believe in reincarnation and karma. This shows what is a meaningful life and what is a meaningless life; what is right and what is wrong. I want you to know that this is very important. Otherwise, you just think commitments are wasting your time or taking time away from sleep or your job or something else. It’s not like that. We have been sleeping from beginningless rebirth and that’s why we are still in samsara. Even sleeping is supposed to become Dharma, and so is eating, walking, sitting, doing our job, washing, etc. These actions can become Dharma, the cause of happiness, but as I have explained already, because the motivation is only for the happiness of this life, we think this is the most important thing out of all the kinds of happiness. This is attachment, but we are totally distracted by it and these actions don’t become Dharma. Even our Dharma practice and meditation doesn’t become Dharma; even reciting prayers doesn’t become Dharma. This is the danger that happens. Please understand all this, and of course, do whatever you can. The other very important thing is to meditate on the lamrim and to study the lamrim. Meditate on the lamrim subjects by follow the outlines one-by-one, not just meditating on what you like and giving up what you don’t like. Start from the beginning and go to the end. You have to do this to train the mind. For the rest of the day do every action with bodhicitta as much as possible, to benefit other sentient beings as much as possible. Then your actions such as sleeping, walking, doing your job etc., become the cause of enlightenment for all sentient beings. Another very important thing is recitation of OM MANI PADME HUM mantra, Chenrezig meditation. First, generate bodhicitta—the motivation to free sentient beings from the oceans of samsaric sufferings and bring them to enlightenment by oneself alone. For that you need to achieve enlightenment, so for that reason you are reciting OM MANI PADME HUM. Even reciting this mantra without bodhicitta, you collect more merit than the number of sand grains of the ocean; more than the number of snowflakes that fall when it snows; more than the number of drops of rain that come when there is rainfall. By reciting OM MANI PADME HUM one time, you collect more merit than drops of water in the ocean. It’s unbelievable, unbelievable. If you recite this mantra with bodhicitta, you collect more than skies of merits. It is the most powerful purification and you collect the most extensive merits. This is the quickest and easiest way to be born in a pure land. Reciting OM MANI PADME HUM helps you develop compassion for every single sentient being, and it is the main cause of achieving enlightenment quickly. You can recite OM MANI PADME HUM not only on your meditation cushion, but also while you are walking, jogging or going in a car. Tibetan people recite OM MANI PADME HUM while traveling or when they are selling things in a shop. Like that, they don’t waste time. Tibetan Himalayan mountain people, from where I was born, do this. They are so lucky, even though they are beggars, Tibetan beggars or Himalayan mountain beggars, they know this and they recite OM MANI PADME HUM so easily. In this way they collect a lot of merit. In this life maybe externally they look poor, with no material objects, but they collect a lot of merit in this way. Western billionaires don’t even collect the merit they would get by reciting OM MANI PADME HUM one time. Even though billionaires have unbelievable material objects and are very rich, they don’t collect as much merit as Tibetan beggars. Reciting OM MANI PADME HUM even one time makes a big difference. These Tibetan beggars or Himalayan mountain beggars, by reciting OM MANI PADME HUM now, in their next life they will become millionaires or zillionaires for many lifetimes. Western or Middle Eastern billionaires or zillionaires don’t know this, they don’t know Dharma, they haven’t read Dharma, so everything they do—eating, walking, sitting, sleeping or doing their job—everything is done with attachment, just for this life, so it all becomes negative karma. Then in the next life they go to the lower realms. That’s the reality. This is just the reality. I want to inform you of that. Thank you very much. Yes, I accept your confession, thank you very much. Please, you must be aware that death can come at any time—this year, this month, even tomorrow, even today. It can come at any time. The only thing that can help is Dharma. When you practice Dharma, the mind becomes positive, virtuous. Unstained by attachment to this life; unstained by future lives’ samsara; unstained by self-cherishing thought; unstained by ignorance holding the I, the aggregates and so forth as truly existent, while they are not. This is talking about sutra not tantra. According to tantra explanations, the mind becomes unstained by ordinary concepts, ordinary appearances, unstained by the ordinary subtle mind and wind, which create samsara.